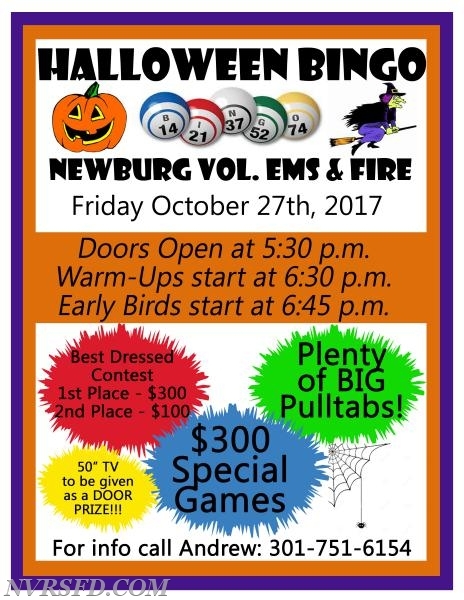 On Friday October 27th, 2017 the Newburg Volunteers will hold a Halloween Super Bingo! Doors will open at 5:30 p.m., with Warm Ups starting at 6:30 p.m. and Early Birds starting at 6:45. a 50" TV to be given as a door prize to one lucky person! Specials will pay $300, and the Jackpot will be $1,500 guaranteed in three parts—the first and second being $250 each and then the coverall for $1,000. Also, there will be a best dressed costume contest with the winner (by crowd choice) winning $300, and 2nd place winning $100! Plenty of big paying holders, a full kitchen open, and many laughs shared! Bring some friends and come on down! Visit www.nvrsfd.com for more info!